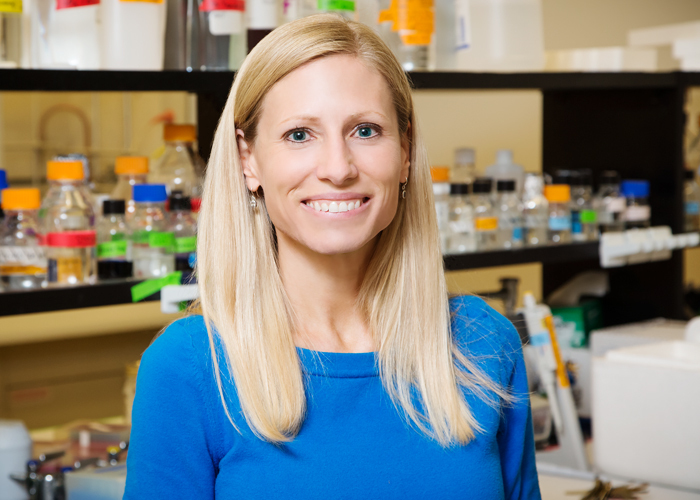 University of Illinois professor of Kinesiology and Community Health, Marni Boppart and her colleagues have published experiments that demonstrate that mesenchymal stem cells (MSCs) rejuvenate skeletal muscle after resistance exercise. These new findings, which were published in the journal Medicine and Science in Sports and Exercise, might be the impetus for new medical interventions to combat age-related declines in muscle structure and function. Injecting MSCs into mouse leg muscles before several bouts of exercise that mimic resistance training in humans and result in mild muscle damage caused increases in the rate of muscle repair and enhanced the growth and strength of those muscles in exercising mice. MSCs are found throughout the body, but several studies have established that MSCs from different tissue sources have distinct biological properties. Typically, MSCs can readily differentiate into bone, fat, and cartilage cells, but coaxing MSCs to form skeletal muscle has proven to be very difficult. MSCs usually form part of the stroma, which is the connective tissue that supports organs and other tissues. Because of their inability to readily differentiate into skeletal muscle, MSCs probably potentiate muscle repair by “paracrine” mechanisms. Paracrine mechanisms refer to molecules secreted by cells that induce responses in nearby cells. Not surprisingly, MSCs excrete a wide variety of growth factors, cytokines, and other molecules that, according to this new study, stimulate the growth of muscle precursor cells, otherwise known as “satellite cells.” The growth of satellite cells expands muscle tissue and contributes to repair following muscle injury. Once activated, satellite cells fuse with damaged muscle fibers and form new fibers to reconstruct the muscle and enhance strength and restore muscle function. Unfortunately, satellite cells, even though they can be isolated from muscle biopsies and grown in culture, will probably not be used therapeutically to enhance repair or strength in young or aged muscle “because they cause an immune response and rejection within the tissue,” Boppart said. But MSCs are “immunoprivileged,” which simply means that they can be transplanted from one individual to another without sparking an immune response. Ozan Akkus and his colleagues from the Department of Mechanical and Aerospace Engineering at Case Western Reserve University in Cleveland, Ohio has succeeded in making fibers made completely from the protein collagen. Why is this a big deal? Because it is so bloody hard to do. In a paper published the journal Advanced Functional Materials, Akkus and others describe the generation of their three-dimensional collagen threads. This is the first time anyone has described the formation of such threads made purely from collagen. Collagen is a very widely distributed protein in our bodies. It is the major structural component of tendons, and most connective tissues, and as a whole, collagen composes approximately one-third of all the protein in our bodies. There are almost 30 different types of collagen; some collagens for stiff fibers and others form flat networks that act as cushions upon which cells and other tissues can sit. Collagen biosynthesis is very complicated and occurs in several steps. First, the collagen genes are transcribed into messenger RNAs that are translated by ribosomes into collagen protein. However, collagen proteins are made in a longer, inactive form that must undergo several types of modifications before it is usable. Collagen synthesis begins in a compartment of the cell known as the endoplasmic reticulum, which is a series of folded membranes associated with the nuclear membrane. Within the endoplasmic reticulum, the end piece of the collagen protein, known as the signal peptide, is removed by enzymes called signal peptidases that clip such caps off proteins. Now particular amino acids within the collagen protein chains are chemically modified. The significance of these modifications will become clear later, but two amino acids, lysine and proline, and -OH or hydroxyl groups added to them. This process is called “hydroxylation,” and vitamin C is an important co-factor for this reaction. Some of the hydroxylysine residues have sugars attached to them, and three collagen protein chains now self-associate to form a “triple ɣ helical structure.” This “procollagen” as it is called, is shipped to another compartment in the cell known as the Golgi apparatus. Within the Golgi apparatus, the procollagen it is prepared to be secreted to the cell exterior. Once secreted, collagen modification continues. Other proteins of the collagen protein chains called “registration peptides” are clipped off by procollagen peptidase to form “tropocollagen.” Multiple tropocollagen molecules are then lashed together by means of the enzyme lysyl oxidase, which links hydroxylysine and lysine residues together in order to form the collagen fibrils. Multiple collagen fibrils form a proper collagen fiber. Variations on a theme are also available, since collagen can also, alternatively, attached to cell membranes by means of several types of proteins, including fibronectin and integrin. Now, if the cells has to go through all that just to make a collagen fiber, how tough do you think it is to make collagen fiber in a culture dish? Answer – way hard. In order to make collagen threads, Akkus and his team had to use a novel method for mature collagen production, and then they compacted the collagen molecules by means of the mobility of these molecules in an electrical field. This “electrophoretic compaction” method also served to properly align the collagen molecules until they formed proper collagen threads. Biomechanical analyses of these fabricated collagen threads showed that they had the mechanical properties of a genuine tendon. Akkus’ group when one step further and showed that a device they designed with movable electrodes could fabricate continuous collagen threads (). Thus, Akkus and his crew showed that they could make as many collagen threads as they needed and that these threads worked like tendons (see here for video). Are these guys good or what? A. Schematic of basic electro-chemical cell layout for collagen alignment; B. Polarized image confirming the alignment of ELAC; C. Human mesenchymal stem cells on ELAC threads at day 1 and day 14. Cell form a confluent layer on day 14. Scale bar: 0.5 mm. Nest, Akkus and his gang seeded collagen threads with mesenchymal stem cells (MSCs) from bone marrow. Remarkably, these collagen thread-grown mesenchymal stem cells differentiated into tenocytes, which are the cells that made tendons. Normally, MSCs do not readily form tenocytes in the laboratory, and they do not easily make tendons. However, in this case, the MSCs not only differentiated into tenocytes and made tenocyte-specific proteins and genes, but they do so without the addition of exogenous growth factors; the collagen threads were all the cells needed. The seeded MSCs made Collagen I, which is the most abundant collagen of the human body, and is present in scar tissue, tendons, skin, artery walls, corneas, the endomysium surrounding muscle fibers, fibrocartilage, and the organic part of bones and teeth. Other tendon-specific proteins that were made included tenomodulin, and COMP (Cartilage oligomeric matrix protein). Furthermore, the electrically-aligned collagen does a better job of inducing the tenocyte fate in MSCs than collagen that is randomly oriented. These remarkable and fascinating results demonstrate scaffolds made of densely compacted collagen threads stimulates tendon formation by Mesenchymal stem cells. Thus electrically aligned collagen as a very promising candidate for functional repair of injured tendons and ligaments. Now it is time to show that this can work in a living creature. Let the preclinical trials commence! !